Star Blazers 2199, known in Japan as Space Battleship Yamato 2199 (宇宙戦艦ヤマト2199 Uchū Senkan Yamato Ni-ichi-kyū-kyū), is the 2012 reboot of the 1974 Japanese series Space Battleship Yamato. This sci-fi space opera follows the events following an interstellar war between Earth and an alien race known as Gamilas. The Gamilas, who make their home base on the planet Pluto, begin bombarding Earth with reformatted asteroids dubbed “planet bombs” in an effort to wipe out humanity and terraform the planet for their habitation. Earth, banding together under the United Nations Cosmo Navy fight back against the aliens, but they are ultimately overwhelmed by the aliens’ superior force and technology. One ray hope comes when Earth finds itself an interstellar ally that offers them an advanced technology, the Dimensional Wave Motion Engine that will help humans travel to interstellar space and the Cosmo Reverse System to aid in reversing the damage caused by the Gasmila’s planet bombs. But first, the Navy must retrieve the CRS, and for that they must build a new battleship with the Dimensional Wave Motion System. The Space Battleship Yamato is developed in secret in the same place where the Japanese World War II battleship the Yamato was sunk and equipped with with the new technologies provided by their alien allies. It must now make its way out of the solar system while coming under constant attack of the Gamila on its crucial mission to help save humanity and the Earth. Star Blazers 2199 and its original Space Battleship Yamato is an anime series whose influence can be seen across many properties, not the least of which is George Lucas’ Star Wars and the original Battlestar Galactica. This remake is a truly fascinating production that is hardly disappointing and far better than the recent live action film, which was just too low budget and frankly, a little too campy. Visually, an anime fan couldn’t ask for much more. This is stylistically eye-catching while keeping a reasonable amount of reverence for the past in the character designs and loading a lot of beautiful details into the artwork and 3DCG. The story doesn’t always flow as well as it could, but the minor flaws are covered up by the excellent action and compelling edge of the seat adventure. 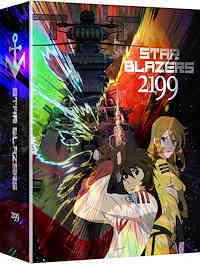 Star Blazers 2199 hits Blu-ray in a more than satisfying 1.78:1 AVC 1080p high definition encodement from Funimation. The digital animation ‘pops’ nicely and the 3DCG work looks strong without much in the way of aliasing. Star Blazers 2199 comes with the original Japanese-language mix ion Dolby TrueHD 2.o stereo. It’s a good mix and fantastic performance from the cast. An English dub from Funimation is also included in a Dolby TrueHD 5.1 mix. The English cast and dub don’t impress me as much and the Japanese cast, but the sound quality of the mix is surprisingly good for Funimation offering a good amount of balance and a fair amount of low end and solid sound effects in the surround channels. The Star Blazers 2199 Limited Edition comes with an excellent set of special features and swag. This beloved classic gets a well-made reboot that looks and sounds great in this part one limited edition set. Star Blazers 2199 – Part One is a totally fun space opera. This classic gets an action-packed reboot as the Space Battlehsip Yamoto must make its way out of the solar system to help save humanity and the Earth from a deadly race of aliens who setup their base on Pluto. If you watch any reboot this is the one you should see.